I came across this spider years ago, while looking for salamanders (which is how I found most of the animals shown on this blog). It was on the silt fence, and when I held the camera up close to it, the spider kept running toward it. Reminds me of the way my cat approaches strange dogs — fluffed up and growling, but too curious not to approach and sniff the dog. The constant motion made it very hard to get a clear photo. When I got around to uploading them from the camera, there were twenty very blurred pictures, and this one. Lizards eat small invertebrates. That’s what lizards do. Insects, spiders, ticks, grubs– all tasty morsels for your local lizard population. When I lived in Florida, I had geckos in the house. I didn’t put them there, but they came in, and I happily let them stay. Because of them, I never had spiders on the ceiling. Lizards eat spiders. It’s the way of the world. But sometimes… Sometimes, a spider defies its destiny. Victory goes to the spider this time. In any job dealing with wildlife in the field, you’re eventually going to have to deal with things many people find frightening, disgusting, or just plain creepy. I have caught and been bitten by snakes, walked through countless spiderwebs, and waded around in ponds with a thick layer of scum on the surface. 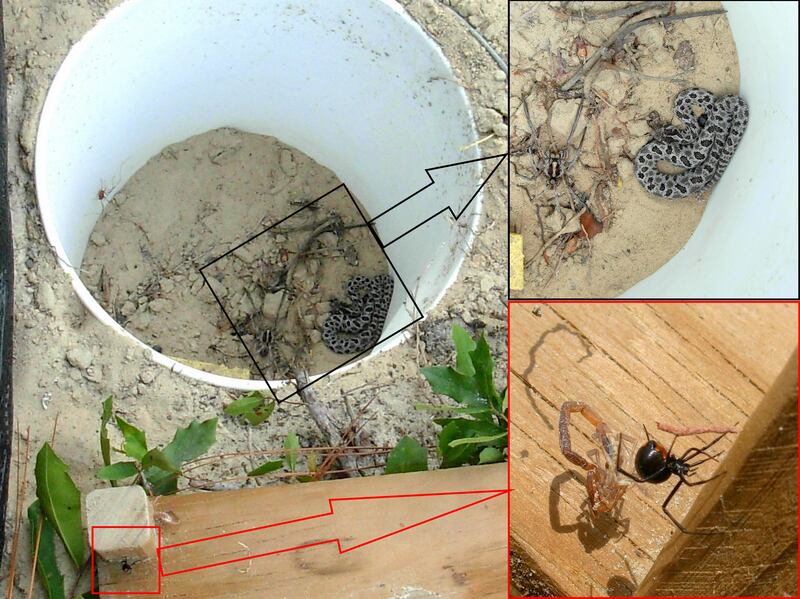 That is a pigmy rattlesnake in the bucket. Next to it is a very large wolf spider. On the underside of the plywood is a black widow spider and the dried-out corpse of a scorpion. An arachnophobe’s nightmare. In response to The Daily Post’s weekly photo challenge: “Close Up,” here’s a little spider hanging from my porch. Hope it eats some of the mosquitoes.